About Wheatsheaf Park Wheatsheaf Park is the home of the Staines Town Football Club. It is situated in Wheatsheaf Lane, Staines. It has been the home of the club since it was purchased in 1951. Like many football stadiums, it has changed greatly over time; the most recent of these changes was the development of the main stand in the Wheatsheaf Lane End. 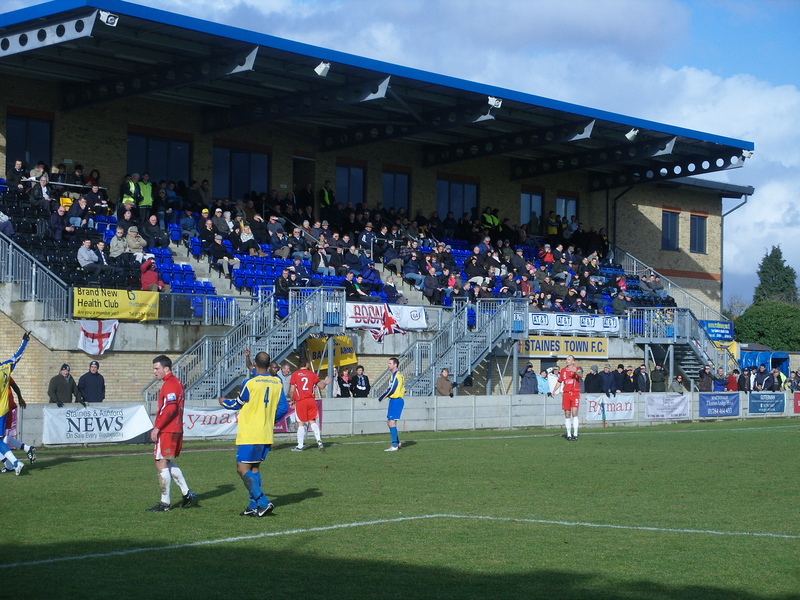 Planning permission for this was granted by Spelthorne Council in March 2000, and Staines Town returned to the revamped ground on 22 February 2003. The club now boasts a brand new sports bar with Sky Sports football each week and refurbished changing rooms. Wheatsheaf Park is one of the most developed stadiums in the Blue Square South. Wheatsheaf Park has a total capacity of 3,000, with 300 seated and 800 in covered terrace. The record league attendance for a match at Wheatsheaf Park is 2,285 vs AFC Wimbledon in 2006, However 1 year later Staines had a historic F.A Cup match against Stockport County and the attendance just creept over the 2,860 mark therefore setting the clubs over attendance record. The ground consists of one main stand, raised above pitch level and three terraces, two of which are covered. There is also plenty of room for standing in front of the main stand. How to get to Wheatsheaf Park By Road: Leave the M25 at Junction 13 and turn east onto the London bound A30. At ‘The Crooked Billett’ roundabout, exit for Staines town centre. Go right through the town, passing the Elmsleigh Centre car parks, next bear left at the junction opposite the Thames Lodge hotel and into Laleham Road. Go under the iron railway bridge next to the river and follow the road for about 2/3 of a mile, turning right by the bollards and into Wheatsheaf Lane. The ground is on the left and sign posted Staines Town FC / The Thames club. By Rail: Staines by rail is on the main Windsor & Eton / Reading line to Waterloo. The stadium is a 3/4 mile walk, exit onto Gresham Road (same platform side if coming from Waterloo) and turn left at T junction into Laleham Road, Wheatsheaf Lane is about 1/2 mile on the right. By Bus: The main bus routes are 216 from Kingston via Hampton, 117 from Isleworth via Feltham and 290 from Twickenham via Sunbury: Either exit at ‘Stainash Parade’ or High street, (both 1 mile walk). From Stainash Parade take Worple Road to ‘Angler’s Retreat’ pub, turn right into Laleham Road, Wheatsheaf Lane is on left. From High Street: Enter Laleham Road at Thames Lodge hotel, Wheatsheaf Lane is on right. Many thanks to Stuart Moore at the club for the above directions. How to get a ticket for Wheatsheaf Park Pay on the door is the order of the day unless the club get another big FA Cup draw. Admission is via turnstiles either side of the main stand in the car park and it is £10 for Adults and £5 for Concessions. Fans can transfer to the stand free of charge. 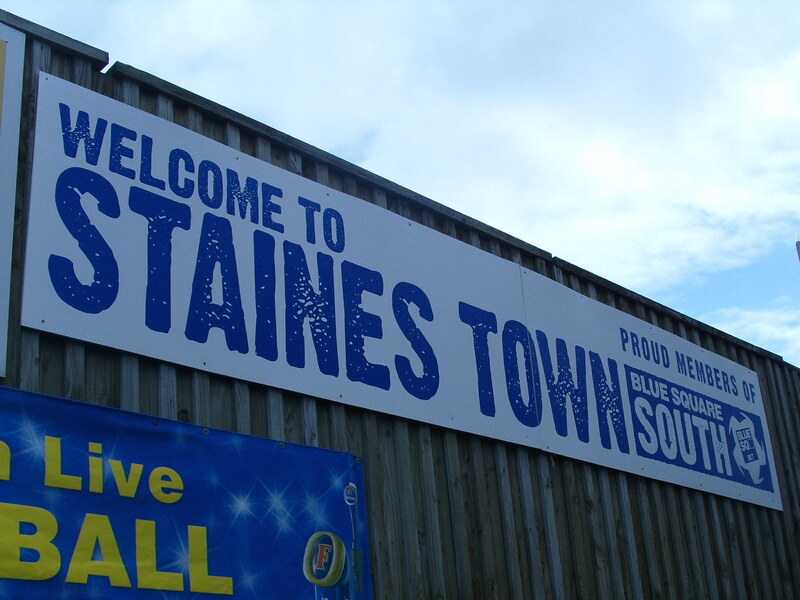 Our last visit – February 2010 One of my goals for the season was to visit all of the Blue Square South teams, and with two months to go I only had 3 to watch a game at and with some careful planning, I was due to see them all within a week starting with Staines Town. Unfortunately, my original plans of a trip to Staines Town were thwarted by the kind heart of my beloved CMF who whisked me away for the weekend to celebrate my 40th birthday when Lewes were coming to visit in January. Never mind though as Danny Last and the LLF (The Lewes Lunatic Fringe) went instead and recorded events from the afternoon perfectly whilst I was sunning myself in the Biosphere (aka Centerparcs).So excuse the lack of a normal pre-amble as I think that Danny has already given Staines a thorough going over in his excellent piece here. Staines were enjoying their first season at this level after winning a close play off with Carshalton Athletic last season after falling at the same hurdle the year before. The club had been playing in the Isthmian league for so long.Theyhad also enjoyed a good FA Cup run, cumulating in a home tie versus Millwall where the local media went a bit OTT almost comparing thevisit of the Lions fans with a horde of invading Vikings…NIMBY’s I ask you! In fact their form since Christmas had been nothing short of fantastic. Out of a total of nine games, the Staines Massive had won seven and drawn two and they had climbed up the league to sit in a very healthy third place. Goals were simply flowing with twenty four scored, including four last week against St Albans City. Visitors Eastleigh on the other hand had not had the best of weeks. Getting hammered 8-2 at home by Thurrock a week previously is hardly a smiling matter, although at half time when they were 6-0 down a little sweepstake started around us at Upton Park as to how many Thurrock would score. I pulled 8 out of the bag so sorry Eastleigh I profited by a £5 in your misfortune. The thing about the Blue Square South league this season is that it is so wide open, even now with two thirds gone. Take Newport County out of the equation (currently three million points clear with twenty games in hand) and you will see that there are a dozen teams fighting for the four play off spots. Before Christmas it had seemed as if Dover Athletic and Woking had two of these places sewn up but now it is a different ball game as Thurrock, Braintree Town and Staines had usurped them. Consistency is the key at this stage of the season. That and the actual ability to play a game due to the weather. There is an age old argument that it is better to have points rather than games in hand. I would disagree that this is always true (just ak our friends at Durham City with their played 26 lost 26 record if they would rather have a record of played 13 lost 13 with 13 games in hand at this stage?) and with the insistence of the league that the final round of games was to be Saturday 24th April then you can see some teams having to play three or four games a week. Quite why the season has to finish then is unknown. It is not as if many Blue Square players will be heading off to South Africa in the summer, and with the play offs in the North and South divisions being played at club and not national venues then fixture congestion in May is hardly an issue. So after a whole week without a game, it was back on the Road to Hell (for all of you who are younger than 25 this will mean nothing to you) before following the Thames through Chelsea player territory to Chertsey. Most people who live in Staines say they live in Chertsey as it sounds better (not my logic but that of Mr Phil “no I am not the Hull manager, can you see I am not orange” Brown, who actually does live in Chertsey). Rain had been the main threat this week, and with the morning showers out of the way and a quite Twitter assured us that both Staines (and if necessary our “Plan B” at Ashford Town was on). So after passing the firmly shut gates of Thorpe Park, crossing the Thames one more time and then negotiating the Staines one way system we pulled into the car park at Staines Town FC just in time for a beer and a couple of sendings off from Stamford Bridge. The Wheatsheaf Park ground is perfectly positioned in a leafy lane close to the Thames. In fact so close that they actually share it with the Thames Club, a posh toffs gym sort of thing. The team had moved back here in 2003 after a £20m facelift funded by the local council, and what a smart facility they now have. The club even advertise themselves as “Proper Football, Proper Fans” and who were we to argue as we paid our £10 to enter the threshold, hoping to be entertained. So a game between one team on fire and one reeling on the ropes from an absolute whacking a week ago – home win banker surely? Er not at all. This was a real shock for the form book and just underlines the open nature of the league. Staines never got out of first gear, perhaps wishing that the “thin Jeff Winter” (copyright Eastleigh fans) had not passed the pitch fit earlier in the day. The first half was a battle of the two sets of fans. Having become quite an expert in the Blue Square South this season it made a refreshing change to see and more importantly hear two sets of fans not only trying to rally their teams but also out do each other. Staines, perched high in the man stand with their trumpets versus Eastleigh in the covered stand opposite with their drum. Round one to Eastleigh with their rude opening:- “We’ve got the best looking barmaid in the league, Best looking barmaid in the league, Best looking barmaid in the league, And she takes it up the a@*e” I am not sure if said girl was standing there but one young girl was going bright red during the song. Not to be outdone, Staines responded with.. “8-2, you only lost 8-2” Eastleigh drew first blood with a stunning free kick from 25 yards after just 13 minutes. Standing from my vantage point behind the goal I could see Sam Butler lining up for a shot on goal. I tried to tell Louis Wells in the Staines goal but he didn’t listen to me and 10 seconds later I had captured the sports photo of the year as the ball smashed into the net. “What’s it like to win a game?” Sang the Staines massive “What’s it like to score a goal!” Retorted the Eastleigh fans Staines simply could not get going. For a team on such a hot run of form something had either gone missing or simply been left in the dressing room. Their own Mambo number 5, Yado Mambo completed a miserable half for them when on the stroke of 45 minutes he sliced the ball into his own net after a great break down the right by Andy Forbes who had beaten the offside trap and outpaced Danny Gordon before putting a dangerous cross into the box. With the rain falling again the second half restarted Staines picked up where they had left off…“Shoot in a minute, we’re gonna shoot in a minute” was an encouraging cry from the home fans but it hardly sunk in as Eastleigh continued to attack, although they did take any chance they could to wind down the clock. “We just had a shot, we just had a shot, oh gord blimey, oh god blimey, we just had a shot” The home fans did get something to cheer about when a fortunate penalty decision for handball was awarded to them with just eight minutes to go. Leroy Griffiths stepped up and sent Matthews the wrong way. Did we then get the typical late onslaught to look for the equaliser? Er no. Staines seemed to simply think that was all they deserved. If only they had some of the spirit Worcester City were showing some 80 miles southish at Lewes where they had come from a battering for an hour and 3-0 down with just fifteen minutes to go to salvage a 3-3 draw. So that was that. I was back on The Road to Hell within ten minutes, listening to England get embarrassed by the Irish at Twickenham and wondering what the barmaid in question was planning for verse two!